A large-scale work by Sol LeWitt has just been installed on the Walker’s rooftop terrace, the first of 17 new outdoor works that will be joining the newly-renovated Walker campus. The piece—Arcs from four corners, with alternating bands of white and brown stone. The floor is bordered and divided horizontally and vertically by a black stone band (1988/2016)—is a new version of a piece initially designed as a crosswalk for the opening of the Minneapolis Sculpture Garden. A major figure in the development of Minimalism in the mid-1960s, LeWitt (1928–2007) was known for carefully-conceived geometric works based on serial systems of shapes, lines, and colors. These were meticulously executed, either by the artist or by others according to his instructions. LeWitt was also a pioneering voice in the development of Conceptual Art, radically proposing that “when an artist uses a conceptual form of art, it means that all of the planning and decisions are made beforehand. … The idea becomes the machine that makes the art.” LeWitt’s pronouncement defined a way of working that continues to be profoundly relevant to a current generation of artists. 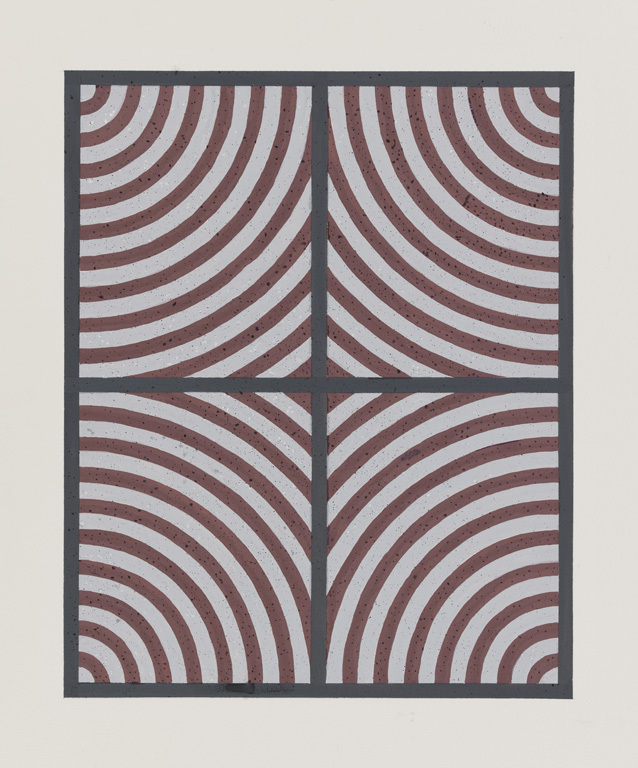 LeWitt was an artist who figured prominently in the Walker’s history, and he had a profound impact on the collection. The center owns more than 200 examples of his work—including sculptures, wall drawings, books, works on paper, and a major work in the Minneapolis Sculpture Garden—many of these gifts from the artist himself. This generous spirit stemmed from LeWitt’s longstanding relationship with former Walker director Martin Friedman, who passed away on May 9. 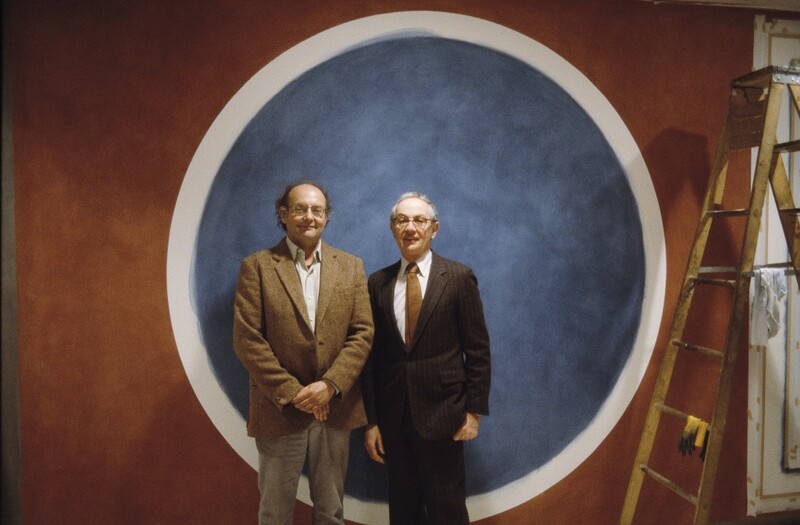 As we celebrate Friedman’s life, we are reminded that it was relationships with artists like LeWitt that built the Walker’s foundations as a contemporary art center, focused on living artists and on the acquisition, presentation, and commissioning of new work. On this latter point, it was Friedman who reached out to LeWitt not once but twice around commissioned work, extending the artist’s engagement beyond gallery works to consider the center’s architecture and outdoor spaces. In 1984, Friedman commissioned a new indoor work from LeWitt, which inaugurated the construction of two new gallery spaces. 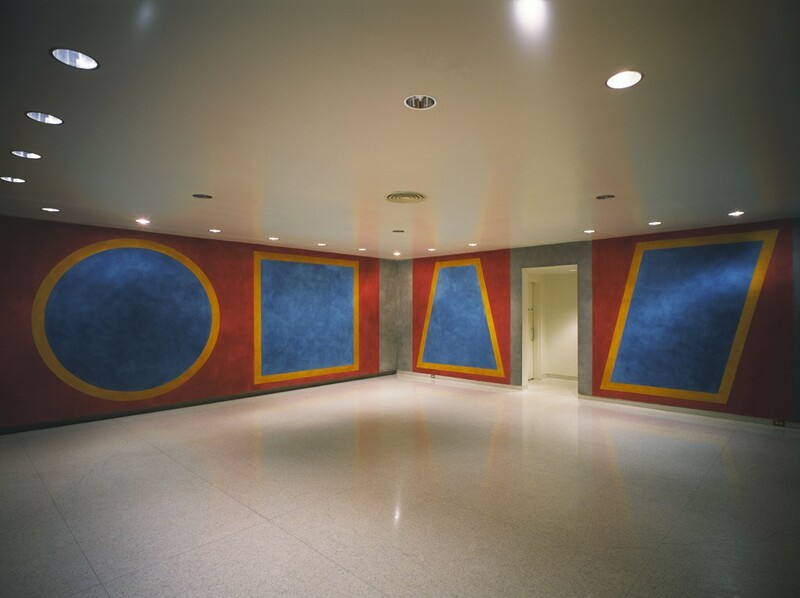 The piece, entitled Four Geometric Figures in a Room, comprised a continuous drawing executed in ink directly on the wall in primary colors. 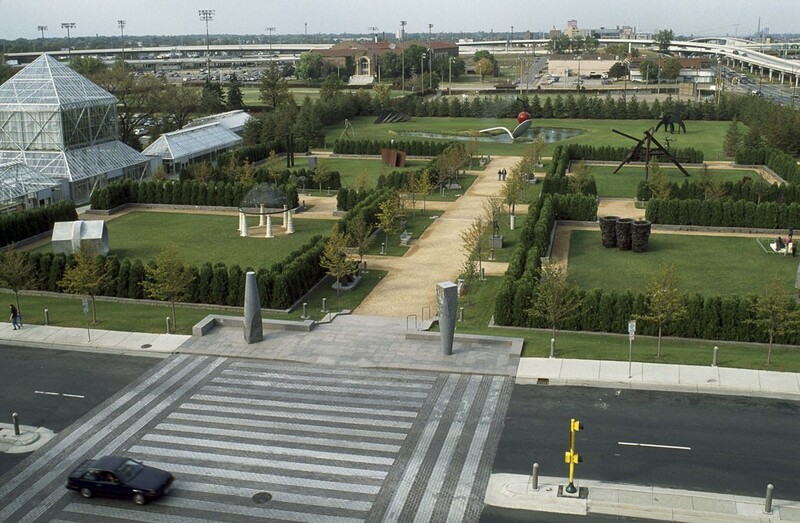 In 1988, Friedman again commissioned LeWitt to create a crosswalk that would connect the Minneapolis Sculpture Garden, which was to open that year, to the Walker’s building across the street. Taking cues from the architecture and materials of the museum’s Edward L. Barnes building, the artist proposed several configurations of red and white paving stones that drew upon his signature language of geometric forms. As the piece needed to be on a public road, a configuration that most resembled a traditional crosswalk was chosen in consultation with the City of Minneapolis. The piece was installed for the Garden’s inauguration in September 1988. However, after the freezing and thawing of seven harsh Minnesota winters—and the attendant plowing, salting, and other road maintenance activities—the piece began to show wear. Ultimately, it was deinstalled in 1995. Upon hearing of the Walker’s plans to renovate its outdoor spaces, Sol LeWitt’s family approached us in 2015 and, as part of the Walker’s 75th anniversary as a public art center, generously pledged the crosswalk as a gift in honor of Martin and Mildred Friedman and longtime Walker patrons Angus and Margaret Wurtele. The fabrication and installation of the piece was then made possible with funds generously provided by the Prospect Creek Foundation. The main provision was that the work be installed with a new design—chosen from a group of six drawings LeWitt first proposed in 1988—in an area where it could be cared for and preserved as a work of art. LeWitt’s preferred design, a variation on a group of works he titled with the descriptive “Arcs from Four Corners,” came into the collection in 2015, and the Walker’s rooftop terrace was chosen as an ideal site, one that could honor LeWitt’s intention of creating a piece that references the Barnes building while also allowing for proper maintenance. The project synched perfectly with the Walker’s design and construction plans for its new entrance, which will open in November 2016. 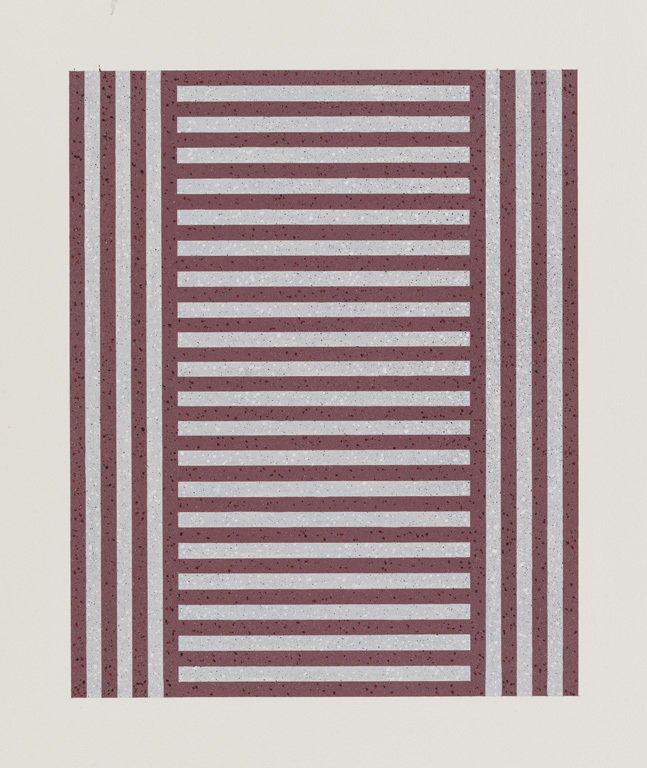 As with all of LeWitt’s works, this piece is executed by others according to the artist’s instructions. Walker registrar Joe King and I worked closely with the artist’s estate, HGA Architects and Engineers, and Mortenson Construction to realize the piece, which is executed in granite on the building’s upper terrace, and is now open to the public. Sol LeWitt and Jo Watanabe, early maquette designs for crosswalk between Walker Art Center and the Minneapolis Sculpture Garden, 1988. Paint on paper; collection Walker Art Center; gift of the artist, 1988. In its new location, LeWitt’s newly installed work will anchor a prominent vantage point of the reimagined Walker campus, to open in June 2017, and will afford panoramic views of the Garden and the downtown skyline. It is fitting that LeWitt’s project—originally intended to unite the two sides of the Walker campus nearly 30 years ago—is now the first piece to be completed, just days before Friedman’s passing, and as the Walker looks ahead to create an expanded and integrated campus experience for the next generation of visitors.